Extra baths to make sure this little minion stays clean and keeps his fever down. Today though, he was a lot better and back to playing. Mom, on the other hand, had the flu hit in full force and was out of commission for the rest of the evening. I pulled out my camera to take a photo before I went to lay back down to rest since I didn't sleep at all from being sick. Hopefully, this is the last round of the flu and we are in the clear for the rest of the season. I was hosting a shootout today and this is what these two were doing when I got home. AJ loves his dads new game chair because he can sit right next to his daddy while they watch the game, cartoons, or just play on their phone and tablet. My Cameo 3 came in the mail today. AJ wanted to play in the box it came in, so to make sure he didn't step all over my new printer, I let him play in the packaging box. It kept him entertained and kept my Cameo safe and sound. Goobs found a random binkie of his and thought it was funny to act like a baby. He has been on a baby obsession lately I swear! I got home from work today and AJ and his father were playing with his plastic wagon. AJ kept sitting in it and made his dad pull him around the house. I guess his father's game chair is so comfy you can fall asleep half out of it. Antonio had to play COD standing up tonight because AJ crashed on the game chair and we didn't want to wake him up. When the first real snow fall hits and actually sticks, we take advantage of it. AJ loved the snow and didn't want to come inside. Me, on the other hand, was ready to go in after two seconds. It was quite the disagreement, and we settled with letting him play in a box because he was mad his wagon wouldn't work in the snow. When Renee and I were growing up, we always loved cold hot dogs. That seemed to pass on to AJ now. He will sit and eat them only cold and won't touch them if they are cooked now. Silly boy. AJ was having fun playing with the Christmas tree today. He kept hiding his cars in the tree then would run back and grab them to drive them on his car mat. AJ had to have his teddy bear next to him when he watched tv. I tried to put him back on the bed and he got mad at me and pulled it back off the bed and sat it down next to him. To funny! If you don't want your photo taken, just hide under a clothes basket.. I only had to clean up the towels he dumped out to do so though. When we have to get some last minute shopping done, Burger King always comes to my bribing rescue. Chicken nuggets are AJ's favorite thing to eat. No shame over here because he'll eat a carton of raspberries after this haha. AJ loves his trains and this was one of the few times that the track I made him stayed intact for over a day. It didn't last long though because the next day he destroyed it. Someone was tired and couldn't wait for mom to get out of work before falling asleep. What's better than cookies? Meckley's handmade donuts that's what! His father and him ate all of the donuts we got while visiting the apple orchard the previous weekend. Bath time fun. AJ has finally been starting to like the shower, which makes it easier on us when he wants to hop in while we are showering. The best place to hide his PJ Masks characters? The Christmas tree. He would put them in the tree then ask me where they went then would pull them out yelling, "there it is!" Too funny. AJ loved his marble track that his Daddy got him for Christmas. We let him open a couple of presents early and he has been obsessed with this little toy. Probably because he watches it all the time on Ryan's Toy Review on Youtube. Merry Christmas Everyone! How this year has flown! I had my family all pitch in for this little car for AJ this year, because let's be real, he has way too many toys that I have no idea what to do with them. His aunt had to get him the Mercedes Benz of course, and let me tell you, that car is awesome. It has lights, a horn, and Bluetooth! The Christmas weekend hangover is in full effect today. So a lazy day it will be for us to gather our energy for the rest of the week. I feel like our living room will forever be trashed from our Christmas festivities. 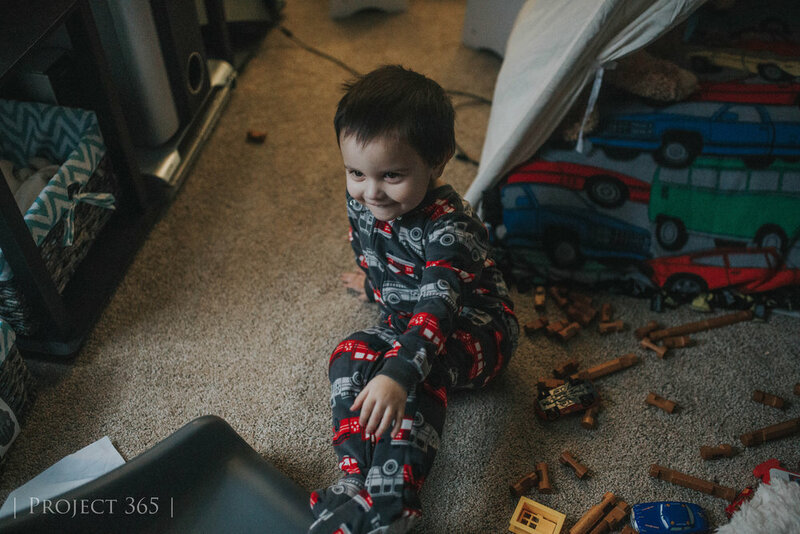 But AJ loves playing with his cars and crashing them into all of the random objects we have laying on the floor. When your toddler tells you to get out during bath time, you improvise. He thought it was funny that I was hiding behind the shower curtain for this though. "The Paw Patrol is on a roll!" AJ plays with his little characters and makes the siren sound as they go down the slide on his new lookout tower. He's got that siren down if I say so myself. Our last Saturday of the year. After meeting his aunt for lunch we decided to have a lazy rest of our Saturday. What better than hanging out in bed watching movies when it is negative feeling out. The last image of the year is probably one of the least technical ones, but is so representational of this year. A little loud and noisy, unsound, full of improvements that can be made, and much like life doesn't have a straight focus. This year brought a lot of ups and downs, growth and heartache, but love. It was full of love. It is kind of sad to see this chapter close, but I am so excited for what is next in our life.